We've been playing around with ideas for cards to welcome a new baby for a while as I was due to become an Auntie again in April. However baby had very different ideas and decided she would put in an appearance mid January - 12 weeks early!!! She weighed just 3lb 1oz and was tiny. After spending 6 weeks in NICU she's now home and well, astounding the nursing staff by piling on the pounds every week - she's over 10lbs now !!! Anyway, this was one of the cards we came up with. 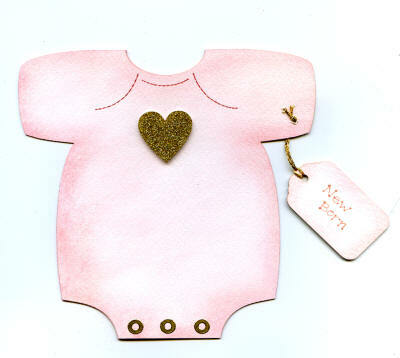 A really easy and quick card to make to welcome the new arrival. Start off by decorating your card blank. We chose to chalk the white textured blank with pink chalk. Highlight the stitching on the vest with a fine tipped marker. Add three eyelet peel offs to the bottom of the vest. These are the poppers. Chalk the edges of a blank tag and hand write your greeting, or if you wish, use a peel off sticker. Thread some craft cord through the hole in the tag, and then thread the cord onto a large needle. Push the needle carefully through the sleeve of the vest an tie off the cord with a knot. Trim the cord. Decorate the baby vest with embellishments of your choice. Sit back and await the new arrival!